Back again with a Smunday Chillin’, a Sunday Chillin’ posted on Monday cause colds require an attention toward a familiar flick rather than a creative tick. So I watched old cartoon reruns and vegged out in bed while temporarily hampering my lifelong search for fulfillment by ingratiating the cosmos. Enjoy this short but sweet mix by FloFilz and Wun Two. Haven’t posted in almost 2 weeks. Been incredibly busy. I don’t see an end in sight for this blog any time soon, but sometimes life gets hectic and the blog isn’t as much of a top priority anymore. It is very dear to me though, and I will always come back. 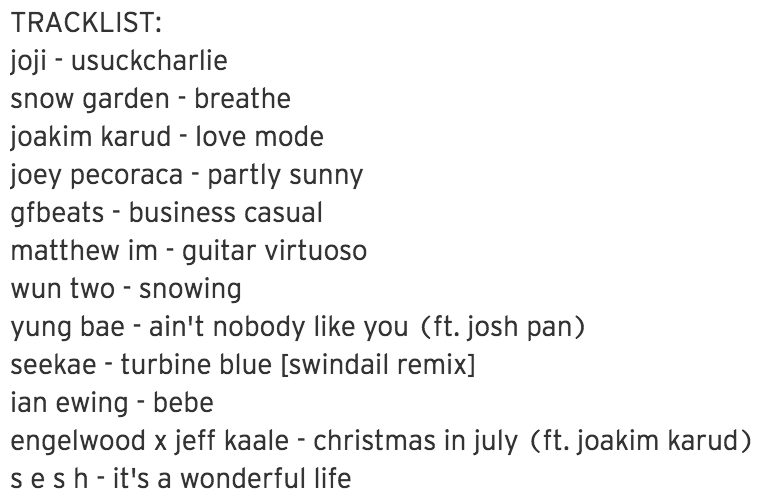 Enjoy this Christmas-y mix by, you guessed it, engelwood. Planning for the future is downright exhausting, but rewarding (I hope). At least I have beats like these to drift away into. Listened to this set during my workout today, and I randomly busted out dancing for about ten minutes. Luckily no one was in the gym… the dancing got a bit weird. But I was fully in it and could not stop smiling. This set is a bit old, but I just heard it for the first time today so I’ll be damned if I don’t share it! Musigh, the blog that inspired me to start my own, finally shut down. The creator had stopped posting years ago, but the client was still running up until about a month or so ago. I asked a bunch of my close friends what songs they think of when they hear “musigh,” and this mix is the result of those memories. Enjoy. We’ll never forget you Beni. Long live Musigh. No idea what GOLMOKGIL means, but here’s #43. Glen Check has been on my radar for a while. “Solid” is the simplest way to describe his productions, but sometimes simple is all you need. 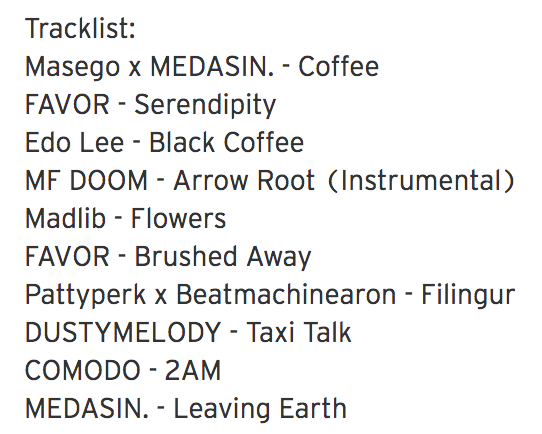 Got a little Treat for you tonight, a mix by Jengi Beats. 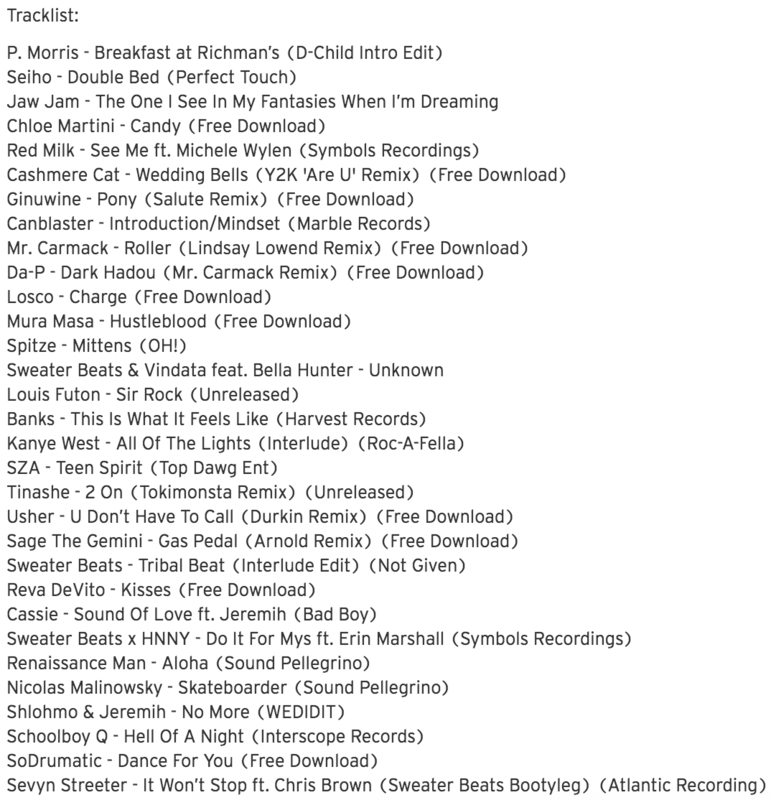 Listened to this mix probably about a dozen times. At least half of those plays were on the road trip last week. Very euphoric mix by Odesza. Kinda bummed I missed them when they were in town last month. Feeling in love with this sound.